I love the points you make here. When dressing vintage and retro, I think it's so easy to get caught up in appearance. I started out dressing retro as a way to remember the past and show my appreciation and love of vintage fashion. As my love for fashion has grown, it's become easier to get caught up in my image, and as a Christian I often have to reel myself in and remind myself of what is truly important. I've noticed this is a struggle for many people in the pin-up, vintage, and rockabilly communities. I love the points you have made, please continue your "Controversial" post series! I haven't gotten much into vintage (though I absolutely love the aesthetic and the community! ), but I have gotten into sewing. In sewing, I obviously don't have the same problems with availability, but I definitely still feel the materialistic, "But I want it!" impulses. It's especially hard when I look at all the amazing sewing on the Internet and think, "Why can't I be more like them?" and a few new patterns and new makes seem like the answer. I agree though, that my faith helps me remember that feeding those materialistic impulses does next to nothing for anyone in a world that has many great needs. Thanks for bringing up some really interesting issues! I agree with you completely and struggle sometimes with this myself. As a fellow Christian, I too, sense myself being pulled into things that can replace my true purpose of glorifying God. One thing that has worked somewhat for me is to fast from eBay and etsy at certain points. I've also tried to view them as more of a wish list for my birthday or Christmas or even just places to find inspiration for future sewing projects. If I don't know it's available or such a great deal, I am more likely to avoid overspending or buying to much stuff. It also helps to have a budget for our household. Ours isn't super specific and it's flexible enough to change as our family and needs change. This lets us prioritize where and how much we spend. The biggest help for me is to remember that as a witness for Christ I should be focused on the inward person and not my appearance. Also knowing that my kids and others are watching me and seeing where the emphasis of my life is. I want others to see Christ in me, not that I have a better collection of stuff or that I love to shop. I think materialism is a problem for most Americans whether we buy vintage or not, and it truly comes down to being discontent with what we have already been blessed with. I hope I can say some day with the apostle Paul that I have learned to be content with much and with little and that I can give thanks in all things. I've also found the more busy I am with things that matter, the less I care about what I have or don't have. Oh, yes. That's something that I've posted about a bit as well. I've always loved clothing, but something about vintage clothing always gets me. I don't lay out a lot of money for one piece, but I can definitely find myself a little too fixated on all of the things that I need to have. And it really can feel like a need sometimes, rather than a want. There's always a reminder, either in vintage movies and magazines or on the internet worlds of blogs and instagrams, that you could do better, have nice things, be a little more perfect. That's definitely something that I've wrestled with, and it can be hard not to tie your self worth to the things you own and how you look. I think so long as I'm conscious of what I'm doing, it's easier to keep things in perspective. Just realizing how silly I'm being about something as trivial as a bracelet or a dress makes it easier to let it go. If I feel like I'm really fixated, I'll put myself on a ban from looking at etsy or ebay. So glad to find someone else who loves the Lord, and is also a vintage enthusiast, but knows how to see the big picture! I haven't had so much of a problem with buying vintage because I have a very meager, sporadic income, so that prevents me from "indulging" too much. 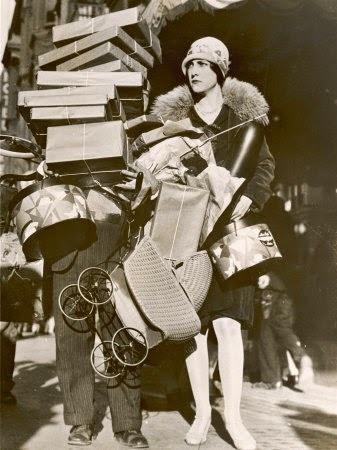 I think it's quite easy to become materialistic, image obsessed and shop happy with vintage. Having a new frock to show off and get compliments on is nice and makes me happy, but that happy will never last and I'll always need more. I have to remind myself that I cannot fill my life with enough clothes to make that hole in my heart go away. They only thing that can do that is Jesus Christ. Thankfully, I am usually good about sticking to my budget and sewing allows me to rock vintage much cheaper than buying actual vintage or repro. I've been trying to get myself to think of new ways to wear things I already have rather than just focusing on new, new, new. I have soooo many clothes and I don't really *need* any new clothes, even if I want to wear vintage everyday. Another thing I try to do is really analyze what I do like and what I actually wear so that when I do add new things to my wardrobe, I'm actually going to reach for them again and again rather than just wearing it once and forgetting about it. That's a good point, Nicole! In fact, I took the liberty of tweeting a shortened version of your last sentence. That's good stuff! This is an excellent post (I tried to comment the day you posted, but blogger ate my comment and I'm just now getting back to it). I struggle mightily with all the things you describe, especially the OOK phenom, especially when something is in my price range. There is the very real concern that the item won't still be there. But I try to remind myself that it is just a thing, and I have lots of unique things, and that a collection doesn't make me happy (in fact having too many things, no matter how unique and treasured) tends to stress me out. I'm giving more things a pass these days, although I've made several poor purchases in the last little while here, mostly because I forgot some basic guidelines that I've set for myself, many of which echo what you write here. It was a good reminder to me to read this. I'm also linking to your article in my next Odds and Ends post (probably going live later this week). That's good stuff, right there! I would love to hear what your basic guidelines for yourself are. And thanks for linking to my post! I'm going to try to find it! This is very good post and not a topic that's addressed much on vintage websites. 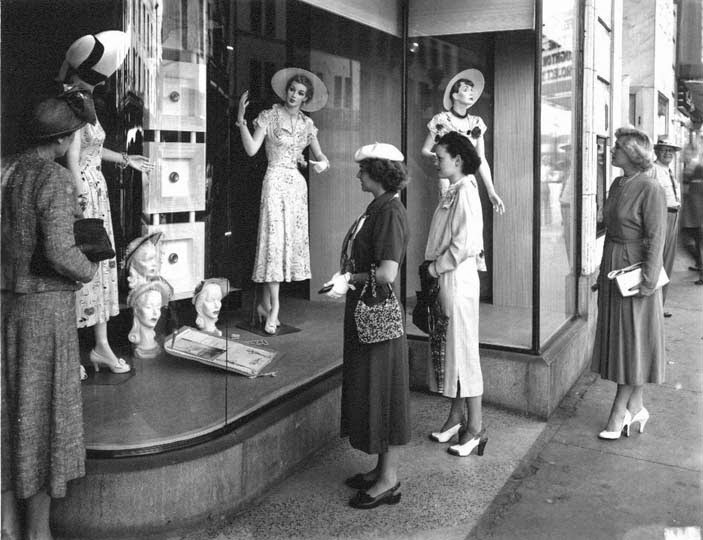 But I think it also has good points for those who enjoy fashion of any kind, not just vintage, but beauty, fitness, etc. It can be easy to get carried away in things that are not inherently negative and often necessary to a certain degree. Wonderful post! And great tips! I originally bought nearly every piece of vintage I could afford and get my hands on, but over the years developed rules for myself that have helped.